Mozart’s Mass No.15 in C major, K. 317, later known as the Krönungsmesse (Coronation Mass), was first performed on Easter Sunday, 4 April 1779 in Salzburg Cathedral. The 23-year-old Mozart had just taken up the post of court organist and composer to the exacting Archbishop Colloredo and was required to write a missa brevis (short Mass) but with full orchestral accompaniment and four soloists. His response was to create a 30-minute masterpiece capable of filling a huge cathedral and creating an atmosphere of great joy. The nickname Krönungsmesse was added in 1862 but its origin is obscure. It may stem from the Mass having been performed in Prague in 1791 at the coronation of Leopold II and also of Francis I the following year. It certainly became popular at the Imperial Court in Vienna in the early nineteenth century as the preferred music for coronations. Zadok the Priest is the most popular of the four anthems which Handel composed for the coronation of King George II and Queen Caroline in Westminster Abbey on 11 October 1727. The words from the Book of Kings have been sung at every English coronation since that of King Edgar in Bath Abbey in 973, and Handel’s setting has been sung at every British one since 1727. Several of Alwyn’s pieces were inspired by the poetry of William Blake. The Innumerable Dance: an English Overture, written in 1933, is a tone poem for orchestra in praise of Spring. The score is prefaced by some verses from Blake’s poem Milton, including ‘every tree and flower and herb soon fill the air with an innumerable dance’ – Blake’s vision of nature in all its glory. The link between the two choirs began in 1969 with a town-sponsored visit to Worms by the Chamber Choir. 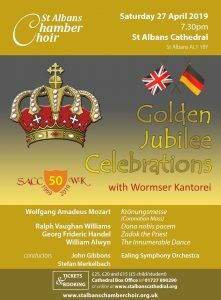 This was followed by a visit to St Albans in 1971 by the choir now known as the Wormser Kantorei, and the first joint concert in what has become the longest-established link in St Albans’ town-twinning programme. For fifty years the two choirs have met and made music together every other year, alternately here and in Germany, and there are many friendships between individual choir members that have been running nearly as long. Today the link is stronger than ever and we celebrate fifty years of music-making together with a concert conducted by both current Musical Directors.